Very cool! And incredibly creative. I would never think to turn bread a specific color :-) I bet your kids were pretty excited about this lunch! I think you made a perfect angry bird. I bet Pierce loved it. A lot of work but it really looks nice. Speaking of seaweed...how do you eat that stuff! I tried it a couple of weeks ago and thought I'd die! That angry bird looks amazing! Great job!! Ha, coolest lunch at the gap this morning! Oh my! I wish I were so talented. I bet any one of my grandchildren would have eaten that lunch. I am stoping over to Muffin Tin Mom. I have got to do lunches like that. You always come up with the cutest lunch ideas!! What a fun lunch!! I see angry birds everywhere when I go shopping.... Some of the customers are angry too! That is super cute Lisa! I haven't ever thought of putting food coloring in my bread. Great idea! So cute--too cute to eat! I love the red bread and the seaweed eyebrows. you are a sandwich artist! SO cute! My big boys would like this! You really put a lot of work into Muffin Tin Monday. You are such a good MOM. Love that angry bird! Good job. Love this! I totally cannot show my daughter your creations. 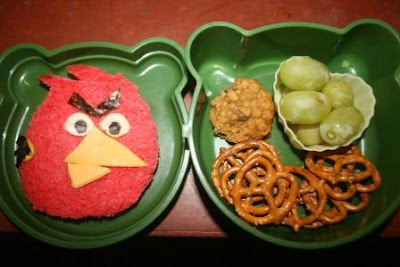 lol She will be expecting Angry Birds in her lunchbox. you are such a clever rabbit.. Ben would love that angry bird bread. You make lunches look so delicious.. I have started making Ben lunches for school after watching what you do with food.. He loves to carry his lunch.. He says "GranAnnie it's such a surprise when I open my lunch box". Pretty funny. I was asked many years ago if I wanted a bread maker and I said I had one, my kids. I make most of mine during the cold months, but miss my helpers. Your boys are so lucky to have a mom that goes to so much trouble for meals. So clever! What lucky little boys to have a food artist mom! !11 Your muffin mondays are so cute. i love seeing these little lunches! so cute and sweet to get them to eat. "That is awesome",says the Angry Bird fan (myself). What a great idea. I love the fun meals to get the kids to eat! I wish I would have thought of that years ago when mine were little.